Iron-Clad Hoax or The Real Thing? PARIS (AP) - It's exactly her size, and its chinks and dents correspond to her war wounds. 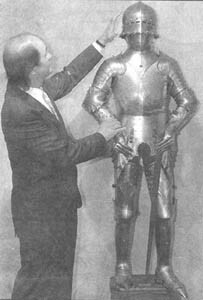 Experts have their doubts, but a Paris antique dealer thinks the suit of armor in his shop belonged to Joan of Arc. "I couldn't be more sure it's authentic if Joan of Arc herself were standing in it," Pierre de Souzy said Monday, posing next to the ornate helmeted suit of armor. De Souzy purchased the suit from an elderly French woman whose family bought it from a British sea merchant in 1760. He said he began wondering about its origins when his 14-year-old daughter slipped it on just for fun. "Oh!" his wife joked. "You could call her Joan of Arc!" A metallurgist at the National Center for Scientific Research dated it to the 15th century and said it seems to have been designed for a woman, not a man. What's more, it stands just under 5 feet tall - just like France's patron saint. Perhaps even more importantly, flaws on the helmet and breastplate correspond to wounds Joan is known to have suffered in battle before the English burned her at the stake in 1431. But experts have their doubts that the armor with its spiked knuckles, winged plates and missile-like toes belonged to Joan of Arc. Curators at Paris' Army Museum said Joan's helmet probably had a visor, and the maker would have stamped a name or a crest somewhere on the suit - neither of which this one has. "There are going to be countless irregularities that make it both challenging and scary to research," said Kent Russell, director of the Higgins Armory Museum in Worcester, Mass., site of one of the world's largest armor collections. Legend has it that King Charles VII of France had Joan's suit made for her at a cost of 100 war-horses. It vanished after she was taken prisoner May 23, 1431. Let us consider the case of Saint Joan's 'White Armor.' This is truly a treasure hunt worthy of 'Indiana Jones!' There are two possible locations for her armor. They are: Luxembourg or Burgundy, France. Some historians believe Joan left her white armor in the Abbey church of Saint Denis, after her failed attempt to take Paris. Once King Charles and his entourage left the town of Saint Denis, it was retaken by the English. The English entered the church and stole Joan's armor and took it back with them to England. Regine Pernoud disagrees with this theory. She believes Joan did not leave her armor, but gave instead, as a votive offering, the armor of a captured Burgundian knight. This armor is now in the Musee de L'Armee at the Invalides, Paris. 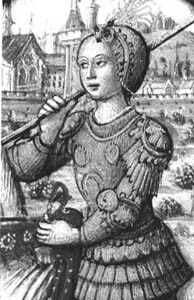 It is more likely that Joan retained her white armor and was wearing it at the time of her capture and it has been passed down in some family of Burgundy or Luxembourg. Perhaps if that family did know what they had, they would not say anything about it because the French government would insist that they give this national treasure back to them. There is another strong possibility that her armor still remains unknown and undiscovered in some storeroom of a castle in Luxembourg or Burgundy. If that is true, then her armor can be distinguished by the following characteristics: There would be a dent in the helmet that occurred when Joan was hit on the head by the stone at Jargeau. There would be a patch in the breastplate from the arrow that pierced her at Orleans. Also the breastplate would have a rounded feminine contour. Finally, there would be a patch or some kind of repair to one of the thigh plates that was damaged or maybe even cracked, by the impact of the crossbow bolt that hit her when she was before Paris. I disagree strongly with his conclusion and I will explain why I believe this armor could never be Joan's. I saw a picture of this antique dealer standing next to Joan's alleged armor in a local newspaper, "The Albuquerque Journal," and will use this picture to dispute his statements. My first impression of the armor was that it was made for a child because it was so small. The armor in the picture may be five feet tall but look at the shoulder width, the width of the hips and circumference and length of the arms and the legs. They are all very small. It is true that Joan was somewhere between five feet to five feet four inches tall but it is also true that she was know to be quite stocky and muscular in her body build. In addition it is a very well know fact that women have wider hips than men do, it would therefore be impossible for Joan to have fit into this armor. Second, Joan wore 'white armor.' The armor shown is gothic. The Historian, Lise Broer, states: "National styles of armor began to emerge during the early part of the fifteenth century. "White armor" usually referred to the more robust Italian designs. The armor shown in this photo is Germanic in style. The French at this time did not have a distinct style of armor. This is a picture of white armor. The term 'white armor' refers to the fact that it was plain armor without any decoration whatsoever. Look how ornately this armor was made with decorative rivets, fluting and a rope design along the edges. Third, look at the helmet and visor, which covered the face. Joan did not use a visor on her helmet, as she wanted everyone to be able to see her face. Her helmet was more like our modern day army helmet than the one shown in this picture. The historian, Ms. Broer, feels that this particular helmet was manufactured around 1450 rather than 1429. Fourth, the fact that Joan was depicted in this type of gothic armor does not mean anything because some twenty years after her death, when the artist drew the picture, gothic armor was in fashion. Joan has been depicted in the sixteenth, seventeenth and eighteenth centuries as wearing the dress of each period. This does not mean she actually wore all these different fashions. Each artist showed her in the fashion of his day. 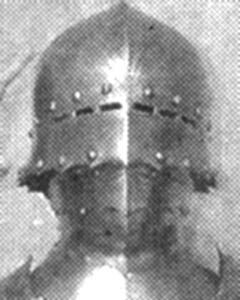 I then computer enhanced the newspaper's picture and obtained even more information that backs my claim that this is NOT Joan's armor. Under computer enhancement it is seen that from the mid-line to the sides of the breast plate that the armor falls back sharply which would give little or no room for her breasts. Joan's armor would have been rounded outward to accommodate her breasts. For Ms. Broer, the argument as to whether this armor actually belonged to Joan or not was settled by a close examination of the gauntlets. 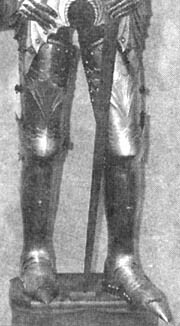 If you will note the finger of these gauntlets have "articulated steel joints" this style of construction did not emerge until decades after Joan's death. In the late 1420's the armorer would have used a metal guard for the back of the hand ending at the first knuckle; the rest of the fingers would only have had the leather of the glove to cover them. Metal plating for the individual fingers (as shown in this photo) did not come into use until the 1450's. Ms. Broer concludes her comments by saying: "The armor in question is a real find even if it could not have been Joan's. Most surviving suits come from the sixteenth century. Mr. Souzy's armor is unusually old and appears to be in excellent condition." One final repudiation, Mr. Souzy states that his armor has 'chinks and dents corresponding to her war wounds." Let us look at this more closely. The word 'chink' means, a crack or fissure, narrow opening. Joan's armor would have more than some dents and narrow cracks in the armor plate because she was injured by powerful, armor piercing projectiles. These projectiles would have punched through the armor plate causing a large inward flaring hole. To repair the holes in the breast and thigh plate the armorer would have to pound out and patch the damage. 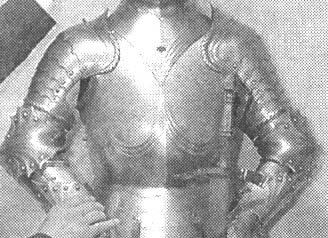 In my enhanced version of the newspaper's picture I see no discernible dents nor any evidence that either the breastplate or the thigh plates were ever repaired.